One of my all time favorite cookbooks is Alicia Silverstone’s The Kind Diet. It is a wonderful vegan resource full of appetizer, breakfast, soup, salad, and dessert recipes. The recipes are truly unique and always delicious. My mouth always begins watering when I get to the dessert section of the cookbook. And the Raw Balls with their chocolately nut base are no exception — they are a rich and decadent treat! First, gather up the ingredients for the Raw Balls. I always enjoy seeing the natural and fresh ingredients laid out on my kitchen counter. No refined sugar here! The first step is to grind the walnuts in the food processor. Then add the carob powder and the almond butter to the mixture. Finally, add in the almonds. Make sure not to over process the almonds! These balls taste great when there are small almond chunks mixed in for added texture. Next, it’s time to roll the mixture into small balls. It helps if you wet your hands before trying to do this as the mixture is sticky. Spread out the coconut flakes on a flat surface and lightly roll the balls until covered in a snowy white layer. Store the Raw Balls in the freezer, and enjoy! Process walnuts in food processor until coarsely ground. Add dates and process until combined. Add carob powder, syrup, almond butter, vanilla extract, and salt and process until the mixture is thick and smooth. 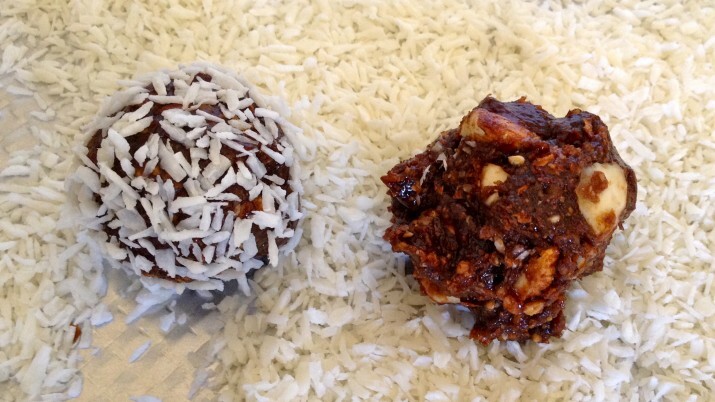 Form mixture into golf sized balls with hands and roll in shredded coconut. Place in sealed container and freeze until hardened.